A.R. 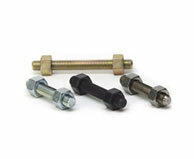 Thomson Group offers a full line of studs, nuts and bolting products. All of our industrial studs and nuts complement the bolted joint assembly and are manufactured in accordance to the latest editions of ASTM and ASME. A.R. Thomson Group maintains an ISO 9001-2008 Quality Management System. Full traceability with heat codes and lot numbers ensures 100% compliance. Positive material identification, NACE, ASTM, and hardness certification are all available upon request.